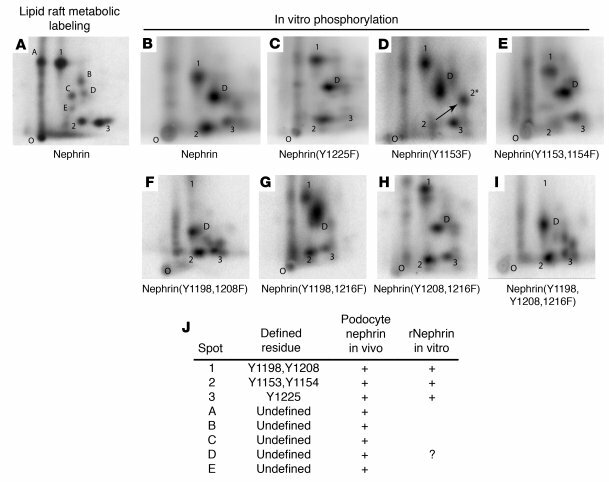 Identification of Fyn-dependent tyrosine phosphorylation sites on nephrin. For in vivo metabolic labeling of nephrin (A), DRM obtained from isolated mouse glomeruli was pelleted, resuspended in kinase buffer, and incubated in the presence of [32P-γ]ATP. These DRM were re-extracted in RIPA buffer, and nephrin was obtained thereafter by immunoprecipitation. For in vitro phosphorylation of nephrin by recombinant Fyn (B–I), purified recombinant GST-nephrinCD or various GST-nephrinCD point mutants were phosphorylated in vitro by recombinant Fyn. Phosphorylated bands representing nephrin protein or its mutants were separated by SDS-PAGE, identified by autoradiography, and processed for 2D tryptic peptide mapping. Representative tryptic peptide maps for radiophosphate-labeled wild type nephrin obtained by both in vivo (A) and in vitro (B) phosphorylation methods are shown juxtaposed for comparison, and corresponding peptides are labeled as defined in J (along with a summary of peptide characteristics). Mutagenesis of individual tyrosine residues was performed to map Fyn-dependent phosphorylation sites. Where single peptides contained multiple tyrosine residues, single, double, and triple combination tyrosine mutants were created. Shown are representative experiments. Note that for peptide 2, mutation of Y1154 had no effect, Y1153F mutation resulted in a shift in mobility (arrow denotes the shift from 2 to 2*), and mutation of both Y1153 and Y1154 to phenylalanine resulted in disappearance of peptide 2. O, origin; rNephrin, recombinant nephrin.